This tour is an excellent choice for everybody, who would like to give the adventure of extended snowmobiling a first try. You will discover the beautiful winter landscape in the area of Kiruna, Swedish Lapland. The distances covered every day are to a certain extend variable and can be adjusted according to the wishes of the group. The route is diverse and offers relaxed driving on wide trails as well as more challenging driving on narrow forest trails. Day 1: Arrival at Kiruna airport/railway station and transfer to our home base (with running water and electricity). Here you will have your first dinner and your guide will outline the tour for you and hand out some extra clothing (overall, boots, mittens and hat), also checking that nobody left important things at home. 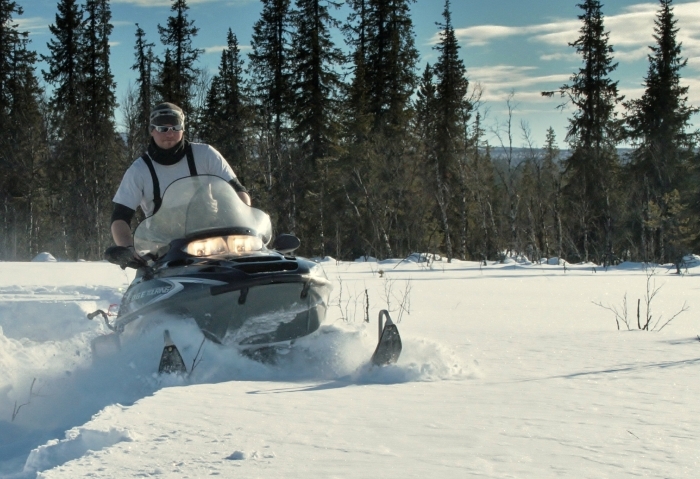 Day 2: After breakfast you will get all the important security- and operating instructions about handling snowmobiles. Then you will start your tour with a about 70 km ride to our wilderness camp at the lake “Väkkäräjärvi”. The route takes you partly over wide trails on the Torne-river and partly over narrow, curvy forest trails. The wilderness camp has no running water or electricity, but as there is no light pollution around this area the chance to see one of the impressive northern lights on clear nights are very good. Before or after dinner you can relax in a wood heated sauna. Day 4: On the last day we head back to our home base. According to the wishes of the group it is possible to stop at the famous Icehotel in Jukkasjärvi and visit the site (distance app. 70 km). Overnight and dinner at our guesthouse.